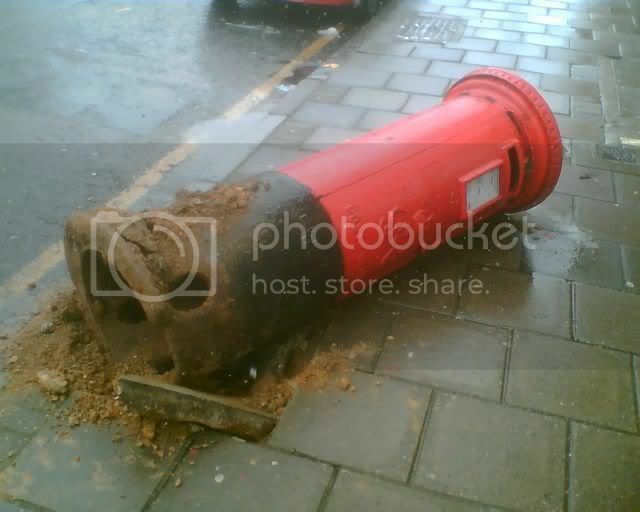 So, there I was, walking blearily up the road this morning for a paper, when I found a dead postbox half blocking my path. I’ve no idea how it happened – from a cursory glance there didn’t seem to be any obvious collision damage, and windy though its been, it’s unlikely to have been uprooted by a sturdy gust – but it just struck me as an undignified situation for such a noble artefact. That postbox must have been there since, well, certainly before the second world war, and has seen the street around it change almost beyond recognition. OK, I’ve not been getting out much recently what with the book to write and everything, but it was a view that left me feeling a little sad. No doubt it will be deemed unsalvagable, and replaced by some functional soulless modern thing. I know I’m writing a history book at the moment so i’m historied up to the eyeballs, but it did sadden me that another piece of history looks as though it’s lost forever.